The California Milk Advisory Board has got to love this. The Board is the organization behind the “California cows are happy cows” TV ads, which say California milk and cheese are better because the Golden State livestock enjoys such balmy weather — way better than, say, frigid, snowy Wisconsin, where cheese is so much a part of the local identity that it’s the state hat (it could have been worse, considering Wisconsin’s love affair with bratwurst). Now scientists at the University of Washington say that Californians have it right, or at least partly so. According to a new study presented at a conference on climate change (at the University of Wisconsin, no less), climate can have a big effect on milk production, and it turns out that Northern California has a nearly ideal mix of temperature and humidity to make cows as productive as they can be. The cows might not be happy (there’s no scientific evidence that pumping out milk in high volume makes for a blissful life), but the people behind the commercials undoubtedly are. The worst place for productive cows isn’t Wisconsin, though, because it’s not the cold that makes milk production drop off: it’s hot, humid weather. You might not mind being a cow in Florida, for example, or other parts of the Southeast, but you don’t want to be a dairy farmer. As the century progresses, moreover, and climate change makes pretty much every part of the country warmer, the problem will get worse: the scientists project a 6 percent drop in per-cow milk production overall by 2080. It might not just be cows, either. The Washington researchers are now turning to other barnyard animals — pigs are due for evaluation next — to see what effect climate change might have on them. In Wisconsin, they’re undoubtedly waiting to see how hotter weather might mess with the bratwurst supply. <a href="http://www.ciat.cgiar.org/Newsroom/Documents/ghana_ivory_coast_climate_change_and_cocoa.pdf" target="_hplink">A report released by the International Center For Tropical Agriculture </a>warns chocolate could become a luxury item if farmers don't adapt to rising temperatures in Ghana and the Ivory Coast, where a majority of the world's cocoa is grown. Coffee lovers may want to get that caffeine fix before the treasured drink becomes an extinct export. Starbucks raised the issue last year when the company's director of sustainability told <em>The Guardian</em> <a href="http://www.huffingtonpost.com/2011/10/16/starbucks-climate-change_n_1011222.html" target="_hplink">climate change is shortening the supply chain of Arabica coffee bean</a>. Famed for producing some of the world's best beer, <a href="http://www.nature.com/news/2008/080502/full/news.2008.799.html" target="_hplink">Germany could suffer from a drop in production due to climate change induced water shortages</a>. Barley and hops can only be grown with water and using cheaper alternatives like corn isn't possible in Germany because of strict regulations about what you can make beer with. Thanks to a failing peanut crop due to last summer's scorching hot weather, <a href="http://www.huffingtonpost.com/2011/10/10/peanut-butter-price-jump_n_1003732.html" target="_hplink">there's a shortage of peanuts in supply</a>. If temperatures continue to rise, a jump in peanut butter prices is just the prelude to what's in store for the beloved American spread. Scientists at the British Meteorological Office warn that Italy may soon be forced to<a href="http://www.theaustralian.com.au/news/world/climate-threat-to-italys-pasta/story-e6frg6so-1225797946930" target="_hplink"> import the basic ingredients to make pasta because climate change will make it impossible to grow durum wheat domestically</a>. The crop could almost disappear from the country later this century, say scientists. <a href="http://www.treehugger.com/green-food/goodbye-maple-syrup-climate-change-pushing-sugar-maple-out-of-northeast-us.html" target="_hplink">A warming climate could make maple syrup history.</a> Shorter cycles of below freezing weather mean sugar maples aren't producing enough sap, which is later boiled down to make maple syrup. <a href="http://usda01.library.cornell.edu/usda/current/Hone/Hone-03-30-2012.pdf" target="_hplink">It's no secret that bee populations are dropping nationwide</a>. Wetter winters and rainy summers make it harder for bees to get out and about to collect, leaving them to starve or become malnourished and more prone to other diseases. This doesn't just mean a decline in honey. We rely on bees to pollinate crops. When bees disappear many food crops could also die off. <a href="http://www.spiegel.de/international/europe/best-served-chilled-top-french-wines-at-risk-from-climate-change-a-748139.html" target="_hplink">France is losing its enviable climate for grape growing</a> thanks to a shifting climate. Because a wine's taste is a result of the balance of sugar and acidity in the grapes it is made from, the right growing temperature is essential. Grapes grown in cold are unlikely to develop fruity flavors, giving an acidic taste. Warm weather produces too much sugar, leaving a "jammy" and heavy taste. 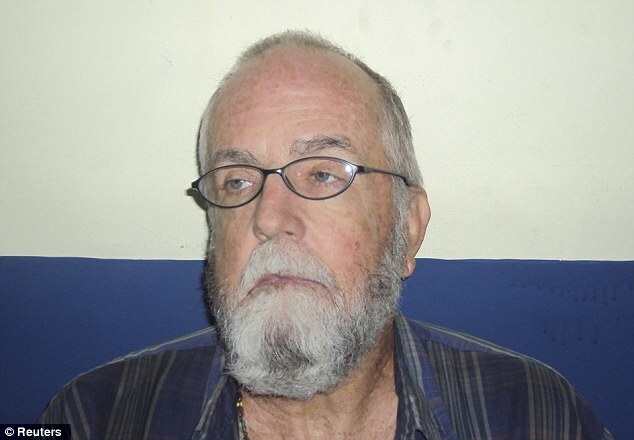 A California man who spent 18 years on the run from charges he had molested a four-year-old girl has been arrested in Guatemala after police released a picture predicting how he would look. 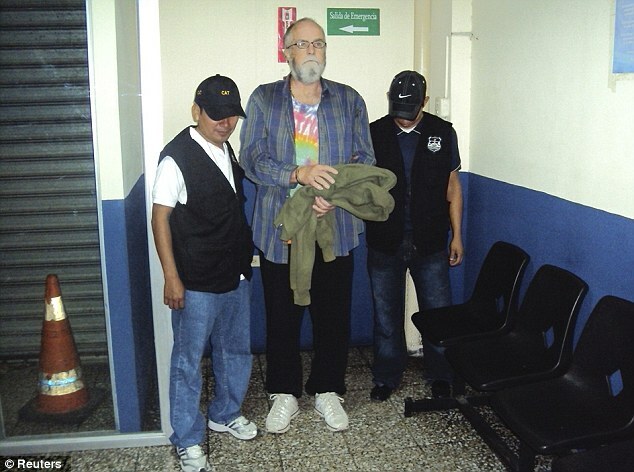 Jeffrey Reed Parish, 65, was taken into custody by Guatemalan police without incident on Thursday and has been returned to the United States. Investigators had taken another look at his case in 2011 and created an age enhanced picture based on his 1994 mug shot. Tips then led them to the country. Parish, originally from Santa Barbara, was found living in Panajachel, about 90 miles from Guatemala City, FBI spokeswoman Laura Eimiller said. She added that the fugitive, who was living under the name 'Blake', did not put up a fight and 'appeared to know why he was being arrested'. He was deported back to the U.S. on Saturday, where he remains in custody, she said. Parish had been scheduled to appear in court in 1994 on charges that he had molested the four-year-old girl in Carpenteria, California. But instead, the gardener jumped bail and left his wife a note saying he would never return. Police believe he may have molested other victims before his arrest and have appealed to the public for more information. Investigators took another look at Parish's file in 2011 as part of a renewed attempt to solve cold cases, according to the Los Angeles Times. They created an 'age-enhanced' picture based on his 1994 mug shot and new information led them to Guatemala. Detectives were helped by authorities in San Salvador and Guatemala. FBI Special Agent Ingerd Sotelo, who was credited with finding Parish with a Santa Barbara County Sheriff's detective, said the man told her he had fled to Mexico before moving to Panajachel. Parish said travelled to the small town after hearing it was home to many Westerners and he sought work as a gardener and called himself 'Blake'. Other people could still be charged on suspicion of helping Parish to remain at large, Toedte added. He is in the Santa Barbara County Jail and no bail has been set. The next time your electricity bill prompts you to curse your local utility, here's another target where you should direct your anger: JPMorgan Chase & Co., which has manipulated the California energy market for its own profit and at a cost to residents and businesses in the state that could be $100 million, $200 million or much more. That's the accusation leveled by the California Independent System Operator, which has jurisdiction over 80% of the state's electrical transmission. The ISO, a nonprofit corporation controlled by the state government, estimates that JPMorgan may have gamed the state's power market for $57 million in improper payments over six months in 2010 and 2011. But that could be just the tip of the iceberg: The bank continued its activities past that time frame, according to the ISO. It also says JPMorgan's alleged manipulation could have helped throw the entire energy market out of whack, imposing what could be incalculable costs on ratepayers. The Federal Energy Regulatory Commission, the regulator of the ISO and its trading markets, has started a formal investigation into Morgan's allegedly manipulative energy deals in California and with the Midwest ISO, which covers 11 states from Michigan to Montana. Forget JPMorgan's well-publicized multibillion-dollar trading loss in derivatives; this trade turned a handsome profit, and it came directly out of electric customers' hides. The toll may not have amounted to much for each of the 37 million men, women and children in California. But collectively it's a massive, illegitimate tax on the entire state. What's worse, it shows that we haven't learned anything from Enron's bogus energy trading, the disclosure of which helped destroy that firm in 2001 and land several of its executives in jail. To the extent it was designed to exploit loopholes in energy trading rules, experts say, the scheme allegedly perpetrated by JPMorgan Ventures Energy Corp. is cut from the same cloth as Enron's infamous "fat boy" swindle, which cost the state's ratepayers an estimated $1.4 billion in 2000. "There's nothing really new under the sun," says Robert McCullough, a Portland, Ore., energy expert who reviewed the ISO complaint at my request. "But it's a cost you're paying in your monthly bill." Asked for a response to the ISO's allegations, a JPMorgan spokeswoman referred me to a court brief the bank filed last week stating that its trading involved no misconduct and pointing out that FERC hasn't found any, to date. FERC says its inquiry is still at an early stage. But given the complexity of the energy market, this may be one of those cases in which the scandal lies not in what's illegal, but in what's legal. One issue raised by this affair is whether government regulators have adequate tools to enforce trading rules. FERC's investigation could take years, and its maximum penalty is $1 million per day of violation. If the agency hit JPMorgan for even six months of misbehavior, the $180-million bill would be a pittance compared with the $14 billion in revenue collected annually by JPMorgan's investment banking arm, which houses the energy trading. The incentive remains for outfits like JPMorgan to stretch the rules to the breaking point — if they get caught, the cost is tolerable; if not, the returns are fabulous. This raises again the age-old question: Can Wall Street be trusted? And it suggests an age-old answer: no. "You set up these rules," says Carl Wood, a former Public Utilities Commissioner who served during the California power crisis of 2000-01, "and you have all these very smart people figuring out how to game them." These are trades that "don't create jobs or economic value," says Tyson Slocum, director of the energy program at the public advocacy organization Public Citizen. Hints of JPMorgan's behavior leaked out this month, when FERC went to court to demand unedited versions of emails it had subpoenaed from the bank. News reports generally treated FERC's demand as little more than a PR embarrassment for Morgan. But the email dispute is a sideshow. The center ring should belong to the underlying allegations of manipulation. These involve an energy trading unit the bank set up in 2005 as part of a plan to make money via short-term trading in a broad range of commodities with rapidly changing prices, including electricity. JPMorgan doesn't actually own any plants providing power to California, but holds contracts with generators allowing it to offer their power in trading markets. The California ISO hasn't been very forthcoming with details of JPMorgan's alleged misdeeds. Its public filings don't even name the bank; it was FERC's court brief that fingered JPMorgan. "The use of a particular bidding practice, in conjunction with the application of the metered energy adjustment factor to the calculation of market revenues used to offset bid costs, resulted in overpayment of bid cost recovery amounts to specific resources." ISO refused our request to put that in plain English. With the assistance of McCullough and other experts, however, we've unwound what JPMorgan is actually accused of doing in the ISO and FERC filings. Be prepared: It's no less ugly for being diabolically simple. SACRAMENTO (AP) -- California Gov. Jerry Brown signed a bill to allow a death-row inmate to help authorities search for the remains of his long-dead victims, the governor's office announced Tuesday. The governor signed AB2357 by Assemblywoman Cathleen Galgiani, D-Tracy, which gives California's corrections secretary the authority to let convicted serial killer Wesley Shermantine help investigators search for more bodies. Shermantine and a friend were known as the "Speed Freak Killers" for their drug-induced killing spree in the 1980s and 1990s. The other man, Loren Herzog, hanged himself earlier this year after learning that Shermantine provided crude maps to lead authorities to the remains of four of their victims. Shermantine is awaiting execution in San Quentin prison for four murders. The tightly drafted bill makes it clear that Corrections Secretary Matthew Cate has the authority to release Shermantine from death row to help find evidence and victims' remains under heavy guard. The bill withdraws that authority on Jan. 1. Lawmakers say there could be as many as 72 other victims. Galgiani became interested in the case in part because her cousin disappeared 31 years ago and could be a victim of the killers. Dena McHan was 19 when she went missing. Earlier this year, authorities found parts of four bodies, two of which were identified as teenage girls who disappeared more than 25 years ago. Authorities identified Cyndi Vanderheiden, 25, who disappeared in 1998, and Chevelle "Chevy" Wheeler, 16, who disappeared in 1985, when they searched a remote Calaveras County property once owned by Shermantine's family. Shermantine was arrested in 1999 after his car was repossessed and investigators found Vanderheiden's blood in the trunk. He was convicted of both murders in 2001. He also was convicted of robbing and killing two drifters near Stockton. Herzog's three murder convictions and 78 years-to-life prison sentence were overturned by an appeals court, which ruled his confession was illegally coerced. He later pleaded guilty to voluntary manslaughter in Vanderheiden's death and was paroled in 2010. Shermantine blames Herzog for the killing spree, while Herzog maintained Shermantine was responsible for the deaths. The Senate and Assembly unanimously approved the bill earlier this month. Justin, a nine-year-old Fresian, has produced a series of paintings which have been shown in art galleries and even sold for hundreds of dollars. A Matisse painting stolen more than ten years ago has been recovered in a sting by FBI agents. 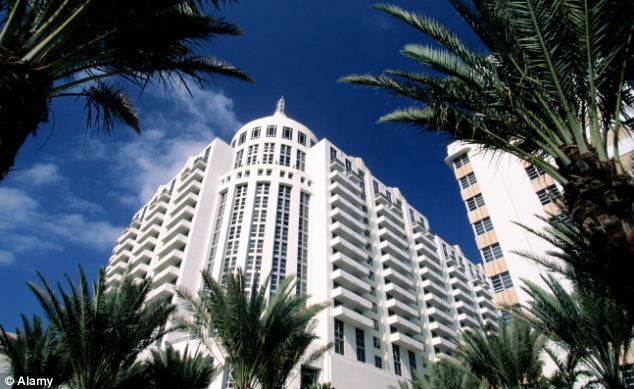 Yesterday a man and a woman tried to sell the 1925 painting ‘Odalisque in Red Pants’ to undercover federal agents posing as art collectors at the Loews Hotel in Miami Beach, Florida. The masterpiece, worth nearly 2million, had been on display in the Sofia Imber Contemporary Art Museum in Caracas, Venezuela, but in 2003 it was discovered to be a fake. The FBI have not yet named the pair, or revealed whether they are implicated in the theft of the painting, but its recovery is big news for those in the art world. 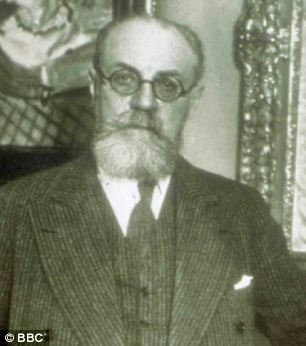 Agents from Interpol, the FBI and Venezuelan, British, Spanish and French police have been searching for the 1925 Henri Matisse painting for nearly 10 years, but no one knew where it was. 'Odalisque in Red Pants’ had been on tour to other museums several years previously and at some point been switched with a forgery. The Sofia Imber Contemporary Art Museum had bought the original painting in 1981, but how and when the painting was replaced with a replica, and by whom are questions still unanswered. There are clear differences between the original and the replica, which Salvestrini explained at a press conference: The fake has a dark shadow behind the dancer, while the original does not. In the lower right hand corner, the genuine painting has seven green stripes. The fake has six. The Sofia Imber museum purchased the painting from the Marlborough Gallery in New York in 1981 for $400,000. It has been on display ever since, except for a brief loan for a Spanish exhibition in 1997. Spot the difference: The fake, right, has a dark shadow behind the dancer, while the original, left, does not. In the lower right hand corner of the genuine painting there are seven green stripes. The fake has six. 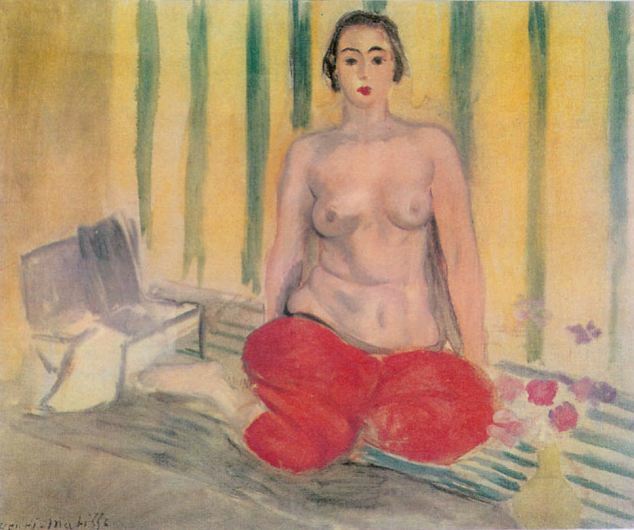 Caracas newspaper El Mundo speculated that the Matisse may have been swapped during the 1997 Spanish exhibition loan. Other clues suggest the painting may have been stolen in 2000. In November 2002, Miami art collector Genaro Ambrosino heard the piece was up for sale and contacted Rita Salvestrini. She pointed out that the painting was in the museum and was not for sale, but after experts examined it they declared it a forgery. Salvestrini has subsequently discovered that over the years a handful of people in the art world had heard rumours that 'Odalisque in Red Pants' was being offered for sale. Some gallery owners had been approached and been offered the painting but investigators have yet to name anyone thought to be complicit in the painting's theft and recent reappearance. In 2006 the French painter's 1904 masterpiece Luxembourg Gardens was stolen from a Rio de Janeiro museum during the carnival, along with paintings by Picasso, Dali and Monet. The FBI's rapid deployment Art Crime Team was created in 2004 and is composed of 14 special agents, each responsible for art and cultural property crime cases in specific geographic regions. The Art Crime Team is coordinated through the FBI’s Art Theft Program in Washington, D.C. where agents receive specialized training in art and cultural property investigations. Once trained they can assist in art-related investigations worldwide in alongside foreign law enforcement officials and FBI legal attach offices. Stolen objects are submitted for entry to the National Stolen Art File (NSAF) by law enforcement agencies in the U.S. and abroad. When an object is recovered, it is removed from the database. Francisco de Goya’s 1778 painting Children With a Cart. The painting was stolen while being transported from the Toledo Museum of Art in Ohio to the Guggenheim Museum in New York. Around 100 paintings stolen from a Florida family’s art collection in a fine art storage facility, including works by Picasso, Rothko, Matisse and others, were recovered from Chicago, New York and Tokyo. Rembrandt’s Self Portrait (1630) was recovered in a sting operation in Copenhagen carried out in cooperation with ICE and law enforcement agencies in Sweden and Denmark. The FBI had also previously recovered Renoir’s The Young Parisian. Both paintings had been stolen from the Swedish National Museum in Stockholm in 2000. 700 pre-Colombian artifacts were recovered in Miami in a sting operation in coordination with the Ecuadorian authorities.